Clan History: The Kumosora Clan is a clan formed from merging the Hatake Clan and the Namikaze Clan after the last 2 members of both clans married each other and had 2 children. Both parents had in-depth knowledge of their respective bloodlines and decided that it would be great to have children who can carry both their legacies at the same time. After several years of planning they had their first son Kai and a year later their second son Kyo, both born in secrecy, hidden from the rest of their respective clan. Though both children were capable of using traits of both clan’s bloodlines they were each trained on one select bloodline, so that it would be easier to have a perfect blood leader for the separate clans. Kai trained more and more to control the white chakra while Kyo trained to master Space-Time. Years past and the two trained together with a separate parent perfecting their skills, both unlocking and learning more and more about their past relatives and the different bloodlines that they are part of their DNA. Kyo trained with his father the Namikaze and Kai trained with his mother the Hatake. When both children were almost old enough to join the academy both their parents died placing a special “dark” seal they created to merge the individual traits their children possessed before they died. A new bloodline was awakened as the seal was placed on both Kai and Kyo, automatically sending them into a mental ordeal so traumatizing that it broke their mind, forever shattering the person they once were. Upon losing their mind the bloodline slowly began to awaken within them. 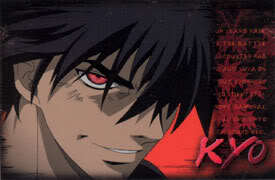 After awakening, their eyes burning like never before both Kyo and Kai were alone, the last of two clans. Knowing that they were brothers they both got together and decided that they would create a new name for their clan. The Kumosora was created, but kept secret for only Kai and Kyo considered themselves Kumosora. After changing the name of their clans they tattooed their back signifying the change they went through. In Kai's case the tattoo of a graveyard appears on his entire back. What makes this tattoo signify his changes is that it has a bolt of lightning streaking through the graveyard at an angle; on one side of the bolt of lightning shows a brightness shining down on the graves through an opening in a cloudy sky while underneath the graves lays a void. On the other side of the lightning bolt shows demonic white flames rising from underneath the graves bathing them in a soft unholy glow as a shroud of pure darkness rains down on them. As for Kyoshiro's it's a tower of darkness surrounded by complete darkness that you only know is there because of the icy red glow outlining it on his upper right arm. Though the fact that both children were born special sent the rest of their clan members into a panick, the Hatake didn’t trust Kai and the Namikaze was afraid of Kyo. This ultimately led to their extinction when they attacked and tried to kill their own leaders. The “dark” seal that was placed on Kai and Kyo cannot be removed by any means and it destroys all trace of the bloodlines abilities and secrets when they die. The seal's properties are well into the blood stream of both Kai and Kyo, it was created that way to remove all hope of cloning the users of this bloodline or even implant their bloodline into another. After a user is cut and their blood is spilled or harvested, the blood turns a darker red color and becomes like an extremely toxic poison with no cure, killing anyone that tries to implant themselves with it and reducing clones of the bloodlines users to ash the moment they are created. It also transfers to their children merging their mother’s bloodline (if she has one) to the father’s creating an infinite variation of the bloodline’s capabilities. Bloodline Type: This Bloodline is a Doujutsu with Elemental power. 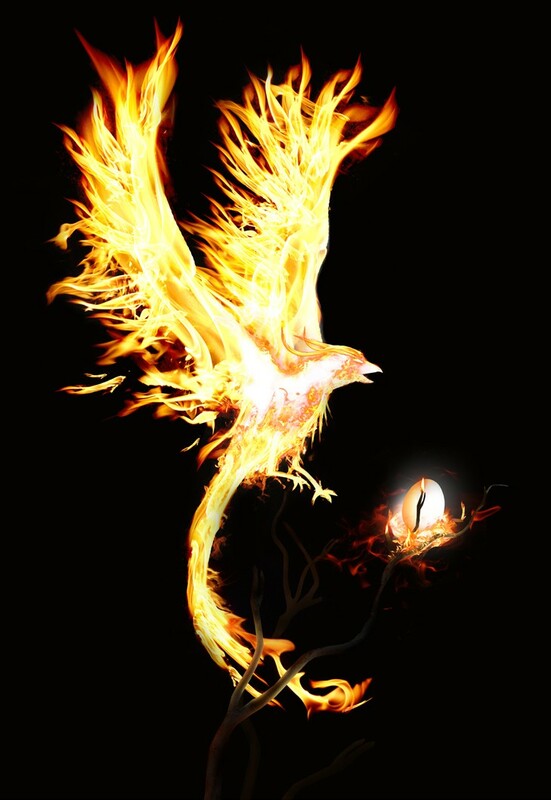 First Stage: “Fushichou (Pheonix)” User’s eyes show a crimson Phoenix in appearing in it. The user is then able to pull chakra constantly but in a balanced proportion from everything around them, forming a fiery aura made completely of natural chakra around them; greatly increasing his/her power and speed. The user’s chakra is infinite as long as they have this stage of the bloodline activated. The side effects of this causes severe burns to the user’s skin if used for longer than 12 posts. The benefit of this stage is that the user does not need to remain still to gather this energy, their bloodline eyes does it for them. Description: After forming a few hand signs the user places his hand on the ground as if summoning. 5 black chains immediately fly out of the ground and wrap around the opponent, each channeling a different element. The chains then bind the opponent disrupting his/her elemental and regular chakra flow, keeping him/her from breaking out or escaping the chains easily. This works exceptionally well against bijuu and their hosts, making it impossible for them to escape without outside interference. This technique cannot be broken by any technique or weapon that uses elements. It can only be broken by either a strong physical attack, one strong enough to break the chains. However any person with multiple chakra supplies is unable to mold their chakra for 1 post after breaking the chains, rendering them incapable of using techniques for that entire post. Second Stage: “Tengoku (Void/Heaven)” The user’s entire eye goes completely white with crimson lightning constantly sparking within it, reflecting all the elements within them when activated. In this state they can copy and use any elemental based jutsu used on them during a fight. Whatever jutsu copied in this state truly becomes those of this bloodline user and remain permanently with the copier and remains a jutsu that they can use at any time they wish. Users also gain the ability to freeze time for a maximum of 10 seconds (only 1 post) in which they can use to attack or evade; this ability can only be used once every fight. Can only be activated when the user has the first stage of the bloodline activated and is trapped in a dimensional technique. The extreme feeling of distress and elemental awareness triggers this stage. Rank: H (Can only be used when the second stage of the bloodline “Tengoku” is activated). Description: This technique allows the users to teleport from one place to another without using any seals or jutsu formulas and goes with twice the speed of the Shimmer technique/Dark Shimmer technique and the Flying Thunder God Technique (Hiraishin no Jutsu). It can be used to travel any distance as long as the user knows where he or she is going. It can also be used to travel to any dimension. Side Effects: Traveling to other dimensions would leave the user feeling weak and their normal functions will be thrown off for about a day or two (about 7 posts after the use of this technique until they can be normal again). Description: This Jutsu allows the user to slow down time around him increasing his reaction time and slow down everything else around him making things seem as if they're standing still while in real time to everyone else he is moving too fast to be seen not even a blur is seen when the user starts moving after performing this jutsu. Third Stage: “Jigoku (Hell)” The eyes becomes all black but does not reflect the user’s elements, instead it reveals a crimson iris. Looking deep within the iris you see normal white flames, and then when the user is angry the flames become a blazing white inferno. The user gains complete immunity to all genjutsu and can reflect any genjutsu cast on them, magnify its power by 110% and use it against the original user. This stage also allows the user to become intangible on command for a few seconds to evade attacks sent at them (This ability can only be used once every 3 posts). This stage can only be activated after the user has a near death experience while in the second stage of the bloodline. The user doesn’t necessarily have to fight someone and be beaten close to death to activate this stage. Any near death experience would activate this stage of the bloodline. Description: Makes the opponent believe that they are in the presence of the devil himself and is being tortured by his minions. This jutsu normally breaks down the mind of the person its used on making them vulnerable to any incoming attack, but if the person struggles and tries to break the jutsu and is not successful it slowly drains their life force eventually killing them. This jutsu can only be broken by breaking the concentration of the user, depending on the intelligence of the user an ally could be very helpful in this situation. This jutsu also takes a while to gather the mass amount of chakra needed for it, leaving the user vulnarable for that select period of time. After the technique is dispelled the user passes out. Rank: H (Can only be used when the third stage of the bloodline “Jigoku” is activated). Description: Allows the user to summon a death god, which surrounds them in a protective manner and takes the soul of anyone who touches it or when it attacks. The death god cannot be controlled by the user completely and becomes harder to control as time goes on because it draws its power from everything and continuously grows in power. It also feeds off of the users emotions and will not appear if the user is in any type of good mood. When it is first used it mimics the user’s movements and weapons when they attack, until it learns everything about the users fighting style then it attacks on its own and cannot be stopped (this happens after 2 posts). This jutsu is only used as a last resort or for a short period of time with the user able to control it (first 2 posts with the user able to dispel the technique). Once it starts attacking on its own, it begins growing in power quicker than before, going berserk until it eventually takes the soul of the user then fades away (Kills the user if attempted to be used in 4 posts or more). This technique is impossible to defend against. Description: This genjutsu is a powerful genjutsu capable of fooling its victim's in to believing they are suffocating and if they aren't skilled and strong enough to break it on their own or have anyone to free them it can kill them .This jutsu is activated one in two ways. One way the Kumosora performs this jutsu is thru eye contact using their Bloodline to boost the jutsu' power and the other is by charging lightning around their fist while open and pointing out towards their opponent and slowly closing their hand in a choking manner. Note this jutsu is extremely hard to detect because it usually activated in the heat of battle. “Omega (The End)” The user is able to gain unimaginable speed and power and are able to compel and control anything and anyone he/she makes eye contact with (doesn’t need to maintain eye contact afterwards after control is initiated). The control lasting until their concentration is broken by an outside force. The user gains infinite chakra and stamina temporarily just like gate users, but their body is totaled afterward. The users are also able to shut off an opponent’s chakra just by touching the opponent after coating their hands in chakra and channeling it through their opponent’s body. This stage drains a lot of the user’s life energy to maintain, shortening their life span drastically. After using this stage of the bloodline the user passes out for a maximum of 10 posts and looses their ability to mold chakra or even fight period for their bodies will be completely destroyed forever being a shell of their former selves. Any attempt made to bring back their prior abilities through medical ninjutsu or other means would immediately destroy the rest of their bodies and they will die. This stage can only be activated while in the heat of battle. If it ever comes down to the point where the user is cornered with no way out and about to die but refuses to give up, the user can then choose to give up all his/her abilities and techniques for unlimited power and potential. However the side-effect of this stage is irreversible and cannot be escaped no matter what the user tries to do. Once the user dies after using this stage, they can never be brought back to life no matter what. Strengths: The users of this bloodline possess tailed demon level chakra and stamina pools. However all though they posses tailed demon level chakra pools, it isn't as potent meaning as powerful as the tailed demons but it is more potent than that of normal for humans. Members of this bloodline have split second fast reaction time to almost anything, sharper sense when detecting chakra, and have the capability to become naturally as fast as Rock Lee after he releases the fifth gate. Their physical strength and intelligence is also impressive and because of this, they usually excel in kenjutsu, taijutsu and ninjutsu. They are also immune to all sealing techniques and are all protected from the sharingan's ability to copy jutsu. Weaknesses: The users of this bloodline are affected by all high level genjutsu techniques (A-Rank and above) and all sharingan genjutsu techniques in the first two stages of their bloodline. Users also become obsessive with whatever goal they are trying to reach and it often blinds them from outside forces, leaving them wide open at times. Unique Traits/Powers: All members possess the void element at birth and can control it completely after a few years of training. Users can also possess the normal chakra affinities as well, though more than one of it is rare. Clan excels mostly at Kenjutsu, Taijutsu and Ninjutsu. Bloodline’s chakra heals user’s wounds as long as he/she remains still, no matter how deep the wound. All members have complete immunity to sealing techniques. Due to the Hatake White Chakra Bloodline mixing in with the users natural chakra, all users of this bloodline gains the immunities of the White Chakra and can use it separate from their normal chakra supply. A rare power in deed the Hatake bloodline has been revered, feared and sought after for many generations. Since the beginning of the clan many wondered at the secrets behind this power. Even members of this clan themselves wondered this. It was not until the clan was confronted with a rival clan from earth country that the world would get a little incite into the secrets of the clan's power. After a decade of war with this clan it was discovered that the Hatake clan possesed two chakra much like a Jinchuuriki . These two chakras came in different colors. One of these chakras was blue in color. This chakra however is nothing really special as it's commonly found in humans as it's the chakra belonging to humans. The other chakra however mysteriously was white and extremely potent and volatile. It was also so discovered that this chakra was limitless and made one seem invincible be quickly healing wounds even the most fatal wounds those those wounds would heal at amuch slower rate, it would still be much faster than the average human. Many soon began to fear this kind of power and that it shouldn't exist. This led their rivals in Earth country in hatred and jealousy to become leaders of their country's ninja village and lead what the hoped would be the extermination of the Hatake against them thus sparking another war between the two. By the end of this war many lives where lost tho more so on the side of Earth Country's forces than the Hatake Clan. Unknown to the fueding clan and country the rest of the world was watching. Witnessing the Hatake's triumph the rest of the world began to want to posses this power as much as they feared it. Soon the Hatake became the world's target as many sought to either destroy them, employ them, or to capture and experiment on them to learn their power's secrets. Seeing what their own power was doing to them the Hatakes themselves began to fear their own powers and slowly began to hate using it and reject it. The Clan's next generation would then bring forth a change in the clan as only a handful of them would be able to access the white chakra. It was also later discovered that those who could could nolonger use regular human chakra. After two more generations of this even fewer members possesed it and the clan weakened greatly. The clan's weakening only further inspired their vast enemies to hunt them down. By the time word started to get out about the rise of a new power in the Sage of Six Paths the Hatake clan numbers dwindle greatly. With an encounter with and enemy from what would later be known as Wind Countries Hidden Sand village two Hatakes were captured and experimented on. Mean while this was happening the Sage of Six Paths legend had grown tremendously and the knowledge of the tailed demons existence became known to the world. Many still seeking power like the white chakra discovered the wonders of sealing the tailed demons from the Sage's legend and began sacrificing their own to seal thes demons in themselves creating the world first Jinchuurikis . Eventually after studying the two captured Hatakes and now with a Jinchuuriki of their own Wind country now had discovered that only one of the two possesed the bloodline and that it protected itself some how against their attempts of obtaining it through breding and cloning. It was also discovered that the white chakra was both was not completely human in nature. It wasn't until the emergen-c of the Five-tailed dog a being that also possesed white chakra that the Hatake's white chakra was also demonic in nature. This soon led many to believe that the Hatake most have known about the tailed demons long before the Sage of Six Paths emergence and either been blessed by the five tails or they also discovered seal demons before the world even knew about it and had at one time seal the five tail within one of their own. This theory has yet to proved or disproven leaving things unknown but it soon became clear it wasn't that latter as the five tail had never been sealed before and wouldn't til yrs later. It was soon notice shortly by a member of the Hatake Clan after a run in with the Nine-tailed fox that while the clan possesed the same chakra in a sense as the five-tails, their chakras were different and that it was hard to tell which of the two white chakra bearers had the stronger chakra. The fox than went on to admit to been following the clans history alongside the five-tails from the shadows over the course of time and that the clan was pretty powerful claiming that in the clans beginning their power ranged from equally to his to slightly greater but as it went on it got weaker now barely keeping level with the five-tail dog (Gobi) the third strongest demon only surpassed by the eight-tails the second strongest and itself the strongest dued to their own fear of power. Now generations later the clan is nearly extinct with its the ability to both wield and posses the still limitless white chakra extremely rare. The chances of a member wielding this power now 1 in 200 the clan began to discover new things. One of them is that the white chakra absorbed other chakras into it and added its properties to those who could master it. Now the clan produces a new generation of this generation one who without fear of the power the clan once had emerged with the white chakra as powerful as it was before the clans weakening.